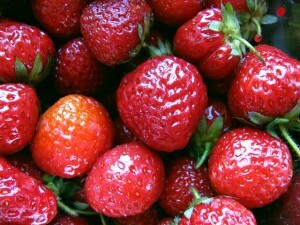 Select strawberries that are bright red and still have their green leaf cap. The caps should look fresh and bright green rather than wilted and brown. Smaller strawberries tend to have more flavor and be sweeter. Avoid strawberries that are soft, moldy or shriveled. Remove any damaged or molding strawberries from the batch. Place strawberries in a plastic container which has been lined with paper towel. Do not wash strawberries until you are prepared to consume them. The extra moisture will cause them to deteriorate more quickly. Wash strawberries and allow them to dry thoroughly. Hull the berries and remove any overly ripe or bruised fruits. Place the strawberries in a single layer on a baking sheet and put them in the freezer. Once they are frozen transfer the strawberries to a freezer container and store in the freezer. Strawberries can also be frozen in a sugar pack or syrup pack. Strawberries need to be picked when they are fully ripe, they will not ripen after picking. Want to grow your own strawberries? Read about Strawberry Planting Tips including when to plant strawberries and how to care for strawberry plants.